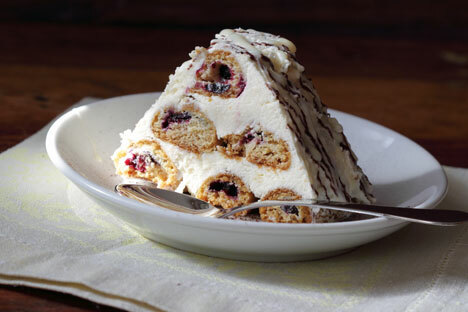 A traditional recipe for “monastery hut” cake becomes a summer treat with fresh cherries. Summer is a wonderful time of year in Moscow for many reasons, not least of which is the abundance of fresh fruit and berries. The recent appearance of fresh cherries at the local markets made me think of a cake that I’ve only made in winter before using canned cherries and therefore always associated with winter food. But then I thought that a cake with fresh cherries can easily become a summer dessert – it would taste great with ice cream and it would also make a lovely treat to have on an open-air balcony at dusk or dawn with a glass of champagne. I first heard about the recipe from my friend who was born and raised in Ukraine. She said her grandmother used to make it. My grandmother had never heard of it and a lot of my Moscow friends hadn’t either, so it might be more of a Ukrainian recipe, like so many great other meals we cook in Russia so often that we almost consider them our own. I am very grateful to my friend and her grandmother for sharing it with me, as I’ve come to love it and use it a lot. I once made it for a Christmas party at the home of some Australian friends. They must have enjoyed it, as I was asked to bring it again the following year. I remember carrying it from the car as I was walking on very slippery ice and being very worried that I might fall and drop the cake. I never even considered that I might fall and break a limb – losing the cake would have been a true tragedy. The cake looks very pretty – sort of like a hut with snow and chocolate on top. This is where it gets its traditional name – monastery hut cake – but it tastes even better than it looks. And whether you have fresh cherries you’re willing to pit or you want to use canned ones (nothing like a little culinary cheating!) it will be well received, and you can use low-fat sour cream or just ice cream! 1. Melt butter and pour it into a large bowl. Add sugar, baking soda and 1 cup sour cream. Mix well. 2. Add the flour and knead the dough with your hands. The dough must be soft, but shouldn’t stick to your fingers. Add some more flour if necessary. 3. Chill the dough for 30 min. 4. Take the dough out of the fridge and form 10 equal balls. Take one of the balls and roll it out so that you get a long strip of dough. Put cherries one by one in the middle of the strip and seal the dough. Repeat the procedure with the rest of dough. It is important to make all cherry rolls equal lengths. 5. Preheat the oven. Place 10 cherry rolls on a baking sheet and bake at 390F (200C for 20 min or until golden brown. Let cherry rolls cool completely. 6. Combine sour cream and sugar and whip the mixture until sugar dissolves. 7. Put four cherry rolls one next to the other on a large dish. Pour some cream over them. Then put three cherry rolls on top of the first layer so that they cover the gaps between the rolls of the first layer. Cover the second layer with the cream. Put two more cherry roll on top of the second layer, pour some cream and make the fourth layer out of the last cherry roll. Cover the whole construction with the rest of the cream and decorate with cherries, cocoa powder or chocolate chips. 8. Serve immediately or put the cake into the fridge for a couple of hours. In this case the rolls will become soft and the cake will be easier to cut.